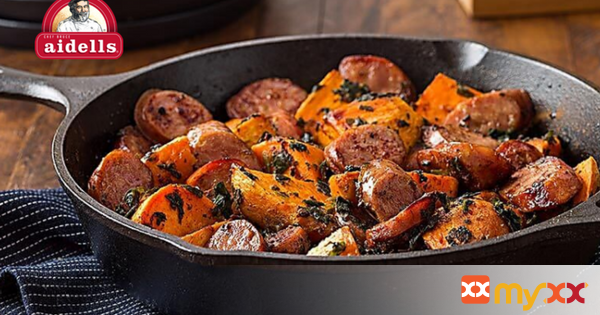 Chicken and apple sausage paired with sweet potatoes makes for a savory weeknight meal the whole family will enjoy. 2. Wash and quarter sweet potatoes. Add to baking pan. 3. Chop frozen spinach into tiny pieces and mix into the pan. 4. Add remaining ingredients and stir. 5. Cover pan with foil and bake 45 minutes at 375 degrees.